Jet Charter Division offers the most comprehensive and efficient private jet charter services worldwide. Our expertise in the business aviation industry is unparalleled with access to a world class fleet of over 5,000 executive aircraft serving 7,500 airports nationwide. 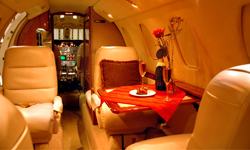 Luxury private jets in a variety of sizes are available in hour’s notice, from turbo props to jumbo jets. This type of availability will help our air charter consultants customize the perfect aircraft for every private flight; whether taking a transcontinental flight or just taking a short island hop.